Short Sail East (A) is a magnificent oceanfront duplex with adjacent beach access. This 4 BR/4.5 BA home sleeps 10: King, Queen, 2 Singles, and Queen + Daybed w/trundle. Master BR has a large sundeck, flat screen TV, master bath has a walk-in tiled shower with dual shower heads and a whirlpool tub. The kitchen is well equipped with new stainless appliances. Plus there is a permanent outdoor charcoal grill. In the Living Room there is a fireplace, big screen LED TV, Blue Ray DVD and stereo system. Wi-Fi throughout the house. Screened porch and sundecks offer expansive views! Other amenities include: Elevator, washer and dryer, ceiling fans, hair dryers, 2 outdoor showers, fish sink, some beach chairs/toys, picnic table and curb-side recycling. All bed and bath linens are included in the rental rate and beds will be made when you arrive so you can begin to enjoy your vacation right away. This side can be rented with "Short Sail" West (B) as one unit for larger groups. Large double doors open to allow easy flow between the common areas. Golfers will enjoy being less than 15 minutes from more than 20 great golf courses. We have been there many times. Marvelous! Particularly love the off-season stays. Beautiful home at the beach.....comfortable, spacious, clean and had an elevator for our elderly Grandma! 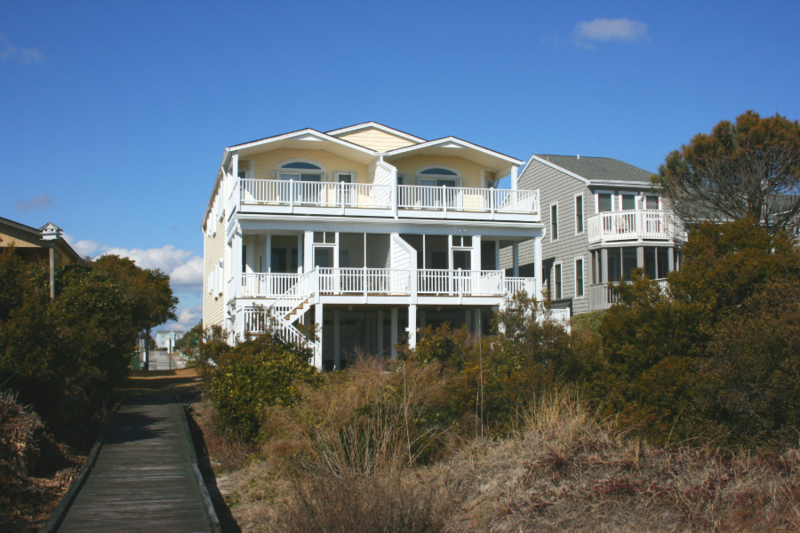 We've had an exceptional week in this fabulous ocean front duplex at beautiful Sunset Beach. The cottage is well appointed, beautifully decorated and comfortable. Our second visit to this property...we loved it! We have really enjoyed beautiful Sunset Beach! This was our first time coming this far south to vacation, but it was worth it! The little ones loved hunting for sand dollars and shells at high tide and the teens enjoyed the sun while reading on the beach or the decks. We tossed the Frisbee and played in the waves and sand. We loved coming in April! Thanks again! My husband and I thoroughly enjoyed our autumn get away last fall. I felt as though we were at someones personal home, with all the amenities we could have wanted or needed plus some Later in the week, we were joined by our adult children and a few of their close friends and they were amazed at the cleanliness, comfort and warm at home feeling we all enjoyed. We were able to complete a puzzle provided, read, watch a USC baseball game on our computer and watch just about anything we wanted on television. I had just had foot surgery and was thrilled that there was an elevator available for use since I was unable to walk stairs at the time. The folks who own the condo obviously wanted others to enjoy sharing in their lovely home as it was fully furnished and ready to just arrive and relax. We have since stayed in this home a couple of times and hope to visit again soon. We stayed there with friends and its the perfect place to just hang or bring the family. Truely luxury on the beach. Highly reccommend.